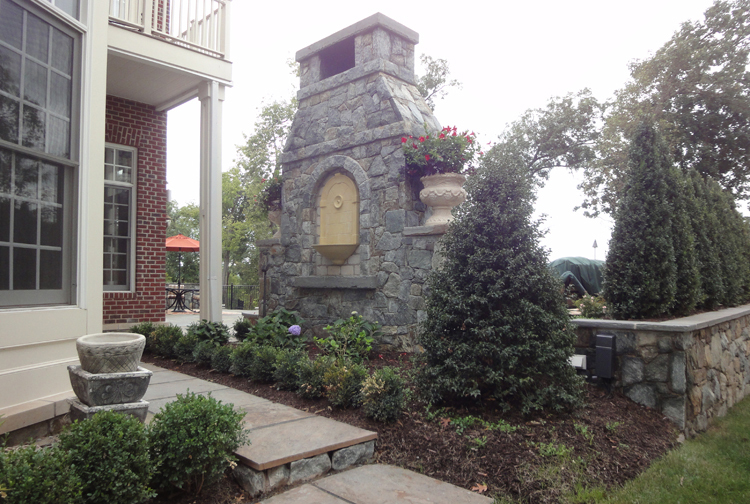 Deciding on the best location for a freestanding outside fireplace on this Leesburg, Virginia, property was tricky. 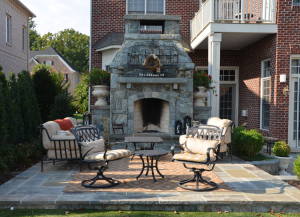 As with any landscape design plan that includes outdoor fireplace or fire pit features, location is a critical consideration. Set on a high bluff overlooking the Potomac River Valley, the backyard of this home is subject to some unpredictable wind conditions. Also, the houses in this development were built close to each other. So, we needed to take care not to disturb the neighbors with smoke. And, we had to locate the fireplace close to the main house — which means we had to be sensitive to size and scale. Our landscape architect had to weigh all the options to find the best location and orientation for this massive stone fireplace. Prevailing wind direction was the determining factor in the orientation and location of the fireplace. The most desirable location aesthetically would have been to set the fireplace with its back to the neighbor’s side lot line. But that would have faced the hearth straight into the wind coming off the river. The best location practically would have been to set the fireplace back to the wind. Unfortunately, that would cause a composition problem. We needed to blend the new fireplace and raised patio with an existing patio. And this “ideal” placement for wind protection would have created a visual barrier, essentially dividing the patio in half. It turns out that the best solution was a compromise. We set the fireplace with its back facing the house because the wind would be at least partially blocked from the side. Usually, we try to site an outside fireplace at the property line or build it into a retaining wall some distance from the main house. So we rarely see the back wall of a fireplace. By adding a fountain and small garden area at the back of the fireplace (facing the house) we created a pleasing view from the dining room interior. Also, defining this small area cleverly offsets the possible claustrophobic effect of such a massive stone structure so close to the house. The original idea was to create a garden outside the dining room doors that led to a raised patio, then stepped down to a circular lawn. 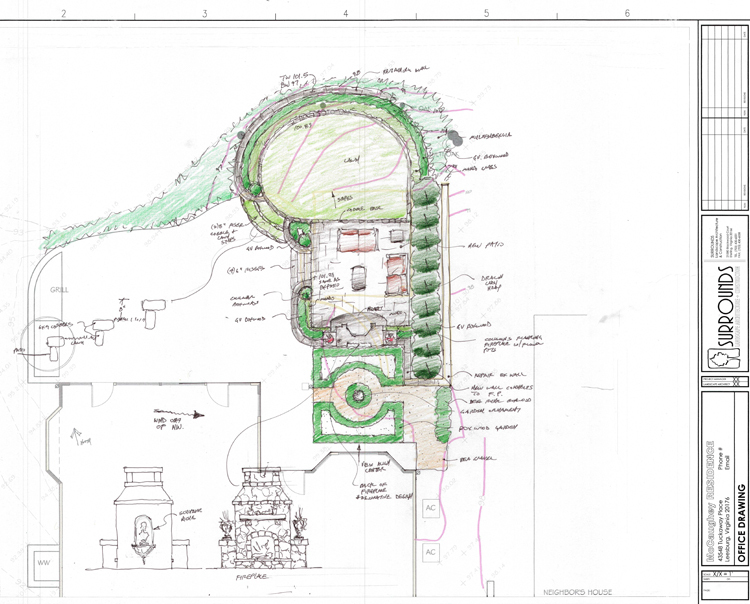 In this first version, the architect used planting beds to soften the effect of all the stone work and added a fire pit to the lower lawn area. But the client had her heart set on a fireplace. And to have it on the lower lawn would block views of the river. So, in the next version, we added a fireplace to the garden-patio-lawn configuration. A row of boxwoods along the property line creates a “green wall” for privacy from the neighbors. The garden niche near the dining room doors was simplified. 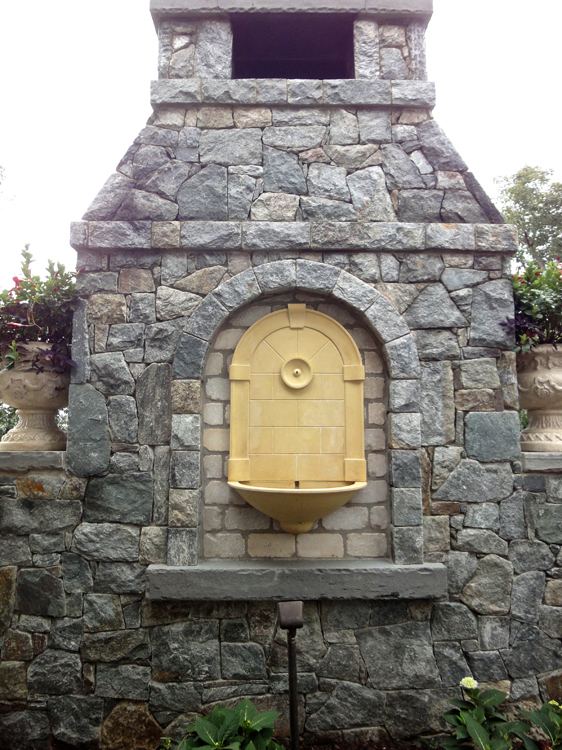 Adding a wall-mounted fountain to the back wall of the fireplace cleverly makes what might feel like an obstruction into a pleasant view. The clients are golfers and the circular lawn suggested a putting green to them. So, in the final round, with a little improvisation and some astro turf, the clients got their wish. We talked to so many companies…. I just wanted to find someone inspiring. Howard has a lot of creative ideas and he’s passionate about them. He looked at the space, looked at what was around it, went through my Pinterest pages and got a feel for what I like. Then he came up came up with an idea that really fit. 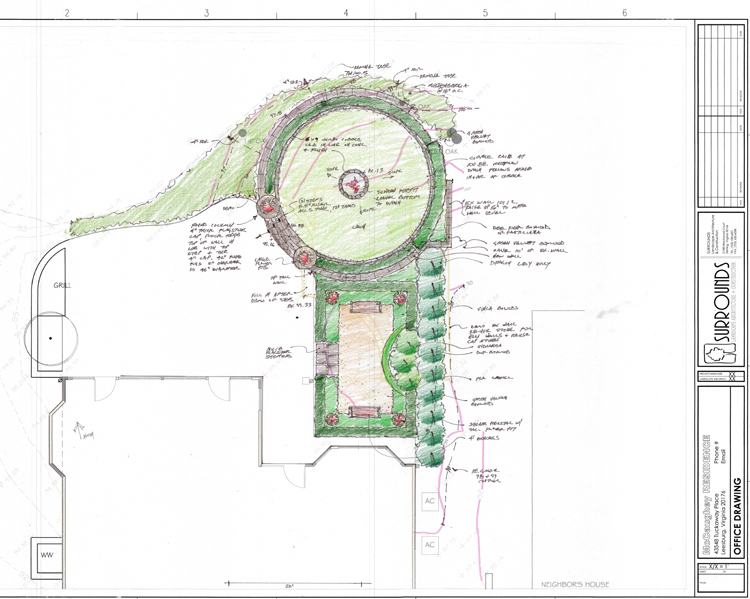 If you have questions about this project or would like to discuss your landscaping project, get in touch with one of our landscape architects.